I love Spotlight for finding documents, but my application launcher of choice is still Quicksilver, mainly because of how I can additionally launch URLs and bookmarks instantly. About the only time I use Spotlight to launch applications is when Quicksilver crashes (alarmingly frequent with Leopard… running B53, not sure what the problem is). Leopard made Spotlight much better as an application launcher by automatically putting your selection on the “Top Hit”, which will usually be an application if your input matches an application name. 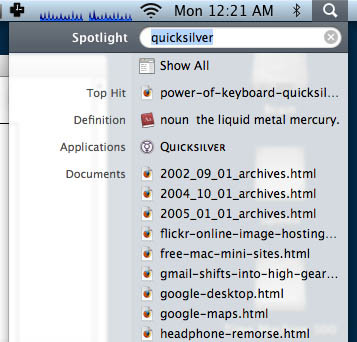 Spotlight never chooses the Quicksilver application as a “Top Hit” for me, instead choosing a document that has the term in it.I don’t have any proof that this is intentional on Apple’s part… but this behavior is consistent on both my iMac and my Powerbook. Every other application will come up as a “Top Hit”, regardless of what documents I have on my machine containing the same text, but Quicksilver never will. Is Spotlight biased against easily launching Quicksilver? Can anyone else verify the same behavior on their machines? Same here, I have a Core Duo MacBook Pro running 10.5.1. I usually have either a font or a folder of that font in the “Top Hit” rather than Quicksilver. I don’t use Quicksilver that much but it’s annoying when I do want to launch it that spotlight doesn’t play nice. However, I just put my computer into Spanish, and while my computer was running that language, quicksilver came up as a top hit. Go figure. My guess is it has something to do with the funky characters in the application bundle. Notice that it’s using small caps, and the ‘E’ in particular looks really weird – weird but cool. Not sure how it’s done, but I’m guessing that’s messing up the Spotlight ranking.